I grew up with two Indian cuisines: The food I ate in Indian restaurants on special occasions, and the food cooked by my grandmother. The biggest difference I noticed between the two came in the bread department. My grandma served us many kinds of breads, but they never included naan. Just like it’s a mistake to conflate all saucy Indian dishes under the vague term “curries,” it’s wrong to assume any bread you’re served in an Indian restaurant is naan. It’s also wrong to call it “naan bread,” which much like the misnomer “chai tea” sounds ridiculous to any Indian person. While naan, the leavened flatbread traditionally cooked in a tandoor, tends to be the go-to choice of bread in most Indian food establishments—especially in its garlic variation—the Indian subcontinent is home to a diverse range of breads. Many of these other breads can be found on restaurant menus… you just have to read beyond the naan. During my early childhood, I never ate naan. My grandma served all of her meals with roti, an unleavened flatbread made from atta, an Indian wheat flour. Also called chapati, roti is cooked on a flat surface—traditionally on a tava—and appears in many different cuisines across South Asia, Southeast Asia, and the Caribbean. Compared to naan, roti is much more simple and bland. You don’t get that hot butter taste that makes naan so decadent. But its simplicity makes roti an ideal accompaniment to just about any dish, and if you eat it the right way, it essentially becomes a utensil, used to pick up sauce-slathered vegetables or pieces of meat. Lose your fork and order some roti if it’s offered on the menu. While it’s most often considered a breakfast food, puri for me was always associated with special occasions. Deep-fried and buttery, puri was always a special treat at my grandmother’s house, and it’s often served during special ceremonies. Also made from wheat flour, puri puffs up into a fluffy dome during the frying process. It tastes like biting into a buttery cloud, releasing hot steam as the dome is punctured. So yeah, days when my grandma opted to serve us puri over roti were very good days. In restaurants, puri is usually served as an appetizer, stuffed with potato or chickpeas. On the appetizer menu, you might also be able to find the street snack panipuri, puri that is fried to a crisp and hollowed out, filled with chutney, spices, potato, and chickpeas. Another wheat flour unleavened bread, plain paratha is cooked in a similar manner as roti but is thicker and richer. The traditional process calls for a buttering and folding method that looks a lot like making puff pastry (paratha combines the words parat and atta, meaning layered dough). The dough is cooked like a roti at first but then finished off with a shallow fry, and it comes out thick and soft. 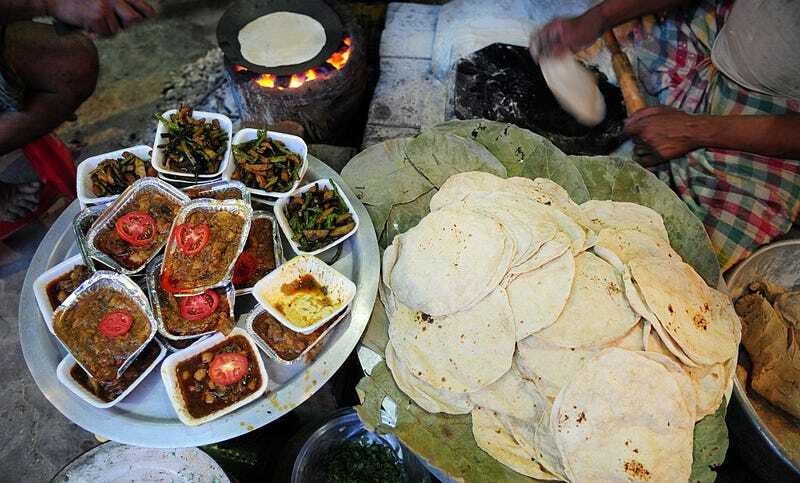 While plain paratha is popular throughout India, in most restaurants you’ll find stuffed paratha. The stuffed parathas don’t require the layering method and usually contain spiced potatoes, other vegetables, paneer, lentils, or some combination of those fillings. Stuffed paratha is good on its own or topped with chutney, raita, or Indian ketchup. While it’s sometimes mistakenly conflated with the Northern variation of paratha, parota (also sometimes spelled paratha) is a South Indian bread entirely different from North India’s paratha. To make parota, maida, another Indian wheat flour, is kneaded with egg, water, and oil or ghee/butter. That dough gets pounded into very thin layers, meticulously kneaded, and then spiraled into a round shape and flattened before being roasted. The finished product maintains a swirled appearance and has a delicate texture. You’ll find this style of parota in restaurants that offer the cuisine of Kerala. While closer to a chip or a cracker than bread, papadum are a thin, crispy snack often served as an appetizer with chutneys or simple toppings like onions or mango pickle. Made from well-seasoned dough that’s typically lentil or chickpea-based, they have bold flavor with a hint of spice. The crisps are usually fried or roasted over dry heat. At some restaurants, fresh, hot papadum are automatically brought to the table as something to much on ahead of appetizers. The packaged papadum that you can find in most grocery stores can be made in the microwave and pair great with a cup of masala chai. Along with dosa, it’s one of the rare gluten-free offerings on this list. Okay, so I know we’re supposed to be tackling breads that aren’t naan, but chances are if you’re a disciple of garlic naan, you might not know about its savory-sweet relative peshwari or kashmiri (the names vary by region) naan. Filled with nuts and raisins, the dough of kashmiri naan also usually contains milk and sugar, making it both fluffier and sweeter than plain or garlic naan. It’s popular in Pakistan (“peshwari” comes from the city of Peshawar), and while it has a completely different flavor profile from garlic naan, it’s worth seeking out if you’re a naan lover in search of something a little different. The differences between kulcha and naan are subtle. Served in northern India, Bangladesh, and Pakistan, kulcha is leavened like naan but is made with baking powder and baking soda rather than yeast. Like paratha, kulcha can be stuffed with savory fillings like potatoes, chickpeas, onions, and paneer. Dosa is technically more crispy crepe than bread, but it’s served in a similar manner to many breads on this list—typically stuffed with potatoes, paneer, or vegetables. Many South Indian restaurants will also roll up the dosa to comically large tubes. The batter is made from rice and black gram and is fermented, giving it a slightly sour flavor. The dosa is slightly crunchy while the filling is usually soft. Masala dosa is the most common offering in restaurants and consists of a dosa wrapped around spiced potatoes. I highly recommend the paneer version, which hits the crunchy-soft ratio perfectly.